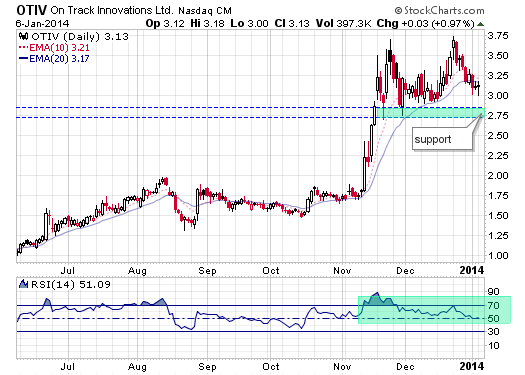 OTIV is a stock I previously wrote about under the Look at this Stock section (click link below under related posts for original article) and it seems to be setting up for another buy entry. In December this carved out a double top pattern, but it was only a short term top. The recent pullback is contained and on small volume and while it could pull back another quarter or so, I’m expecting this to explode to the upside any day now – most likely when the markets end this bout of selling we’re experiencing right now.